I love this boutique hotel idea so much. It just looks so fun- I wish I could have been on this design team. Camping indoors? 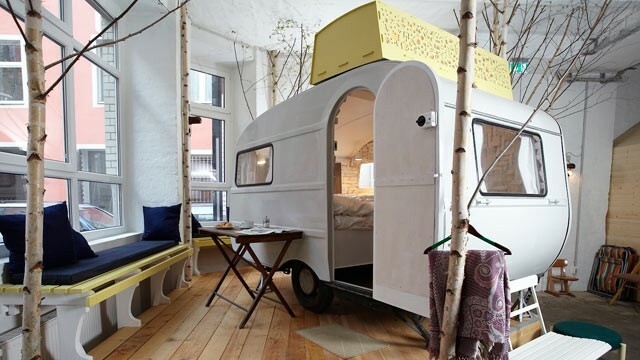 I think it would quite feel like the real thing with this replica camper and birch trees (my absolute favorite). It is even low-budget friendly as there are many “campers” in a big hall, really like being on a campsite. Apparently only 30 Euro a night/person. I assume that it has become a popular choice to stay here as I’ve seen this trending on many sites. So I’m pretty much debating packing my sleeping bag for Berlin right now. Having the hostel-like experience with campsite neighbors (probably mostly young travelers), yet being in a unique boutique hotel- sounds fabulous. I think this is a great way to experience the culture of Berlin- the entire city is constantly up and coming with reconstruction going on since much of the city was destroyed during WWII. I was there in 2008 and the history and restoration were both so powerful and important to see as you always hear about Berlin, but you don’t fully absorb the information until you are face to face with the wall, the graffiti, the modern restorations of war ridden buildings. HBD Madlen!! Wishing you the beauty of this very real backdrop. Just cuz tonight was a beautiful NY night... like this image. #newyorkiloveyou and you’re not bringing me down.